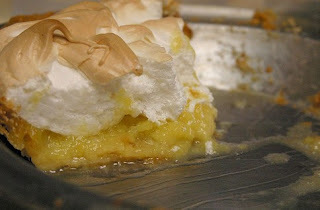 Lemon Meringue Pie - It's about time for a dessert around here, if I say so myself. 'Trouble is, I was at a loss as what dessert to make, so I asked my husband. 'I should have guessed what he would request. 'He's been asking for this pie for months, and I keep promising to make it, but finding excuses not to do so. 'If I'm honest, I don't like the 'meringue' part of the pie. 'I am generally opposed to anything fluffy and white when it comes to food (yes, whipped cream included). 'But, love is love, and so I made the pie. Pies are intimidating aren't they? 'You never know if they're going to turn out right, if the filling is going to be soup, and let's not even get started on the crust. The first time I ever made a pie all by myself, I had to roll the dough out on my kitchen table because I lived in an apartment with a counter-less kitchen. I'have probably made ten pies since then, which doesn't exactly put me in the category of proficient pie-maker, but it has given me enough confidence to know how not to totally ruin a crust, and that no matter how it turns out, it will still taste good, even if it ends up 'as pie soup. The only thing I recall doing differently, were that I used all butter in the pie dough, instead of the suggested combination of butter and shortening. 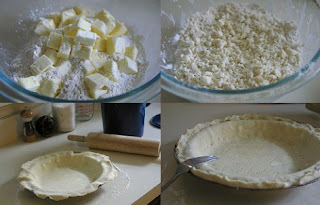 'First of all, I didn't have any shortening, but also, I've still been able to get flaky pie crusts using just butter. Blend together flour, butter, and salt in a bowl with a pastry blender just until mixture resembles coarse meal with some roughly pea-size butter lumps. (Original recipe says you can use a food-processor, but I don't recommend it, because you can take it beyond the point of no return too quickly, and also, it's just more parts to clean.) Drizzle 4 tablespoons ice water evenly over mixture (in a bowl) and gently stir with a fork until incorporated. Note: After cutting the butter into small pieces, I like to throw them into a bowl and put them in the freezer for 5 minutes or so, just to make sure the butter is really cold when I start to cut it into the flour. 'It will help in the quest for flaky crust. 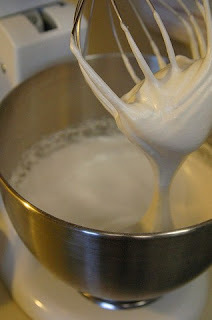 Squeeze a small handful: If dough doesn't hold together, add more ice water, 1/2 tablespoon at a time, stirring until incorporated. Do not overwork dough or pastry will be tough. Once the dough is holding together, knead it just for to make sure it's all holding together, and then form it into a 5-inch disk. 'Do not be concerned if you see visible pieces of butter, as that is ensuring you will have a flaky crust. Wrap the dough disk in plastic wrap, and chill for at least one hour. Line shell with foil and fill with pie weights or raw rice. Bake until side is set and edge is pale golden, about 20 minutes. Carefully remove weights and foil and bake shell until bottom and side are golden, about 20 minutes more. Remove from oven and reduce temperature to 350'F. A few things to mention here at the end: 'First, I forgot to add the 2 tablespoons of butter at the end of making the lemon filling. 'The filling still tasted good, but mine probably lacked a bit of smoothness and creaminess that the butter would have added. 'Secondly, I found the best way to get the meringue on top, was to use a regular spoon instead of a spatula. 'Thirdly, while my pie did not turn out totally soupy, it certainly wasn't totally firm. 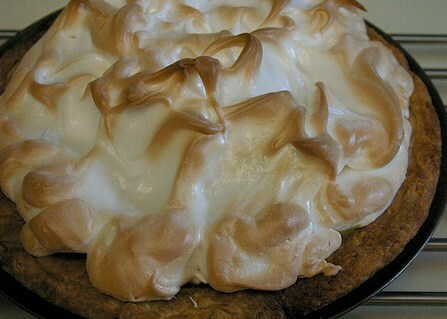 'However, I do not remember eating many lemon meringue pies that were very sturdy. 'Finally, my husband loved the pie, which was the whole point.